Direct replacement for YPC33-12, well packaged and delivered as promised. Brilliant product. Top class service. Highly recommended! Replacement batteries for 5 inch gauge model locomotive. Does the job well, prompt delivery. Back on track! Livraison rapide et prix intéressant que demander de plus!! 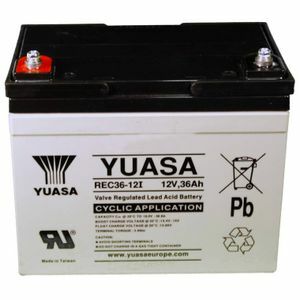 I have found over many years that Yuasa batteries have given better and longer service than other makes. The battery was very well packed and quickly delivered. Arrived quickly & well packaged. Easy to fit and already nearly fully charged. Only fitted a week ago so too soon to compare with the previous ones. Excellent service from placement of order to delivery of the goods. My order arrived promptly and advised when it was being delivered. What can I say, the batteries are first rate and advice service & delivery was exemplary, having these new batteries have given me my independence back & I wouldn't hesitate recommending this company to others.